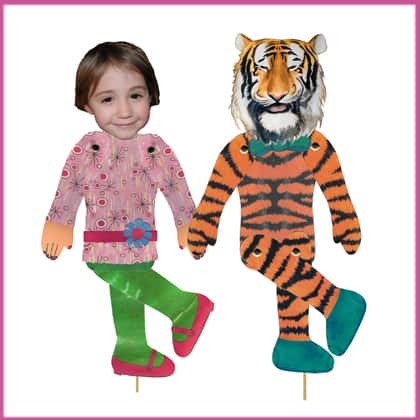 Tigercandy Arts, Inc. has some of the most creative and funStick Puppet Kits that I have ever seen. I recently had the chance to allow my children to create their own stick puppets with the Stick Puppet Party! Kit. Before we even started, we had so much fun deciding what stick puppets my children wanted to create. With the Stick Puppet Party! Kit by Tigercandy Arts, the sky is really the limit. We finally settled on a birthday party theme. We used photos of the kids that were the right size and they cut out the heads (or you can draw your own). Next we followed the easy steps on the instruction sheet and after over an hour of fun, laughter and lots of brainstorming my children had created “themselves”, their beloved dog, Jack and of course, lovable “Mommy.” After allowing the large size puppets to dry for 10 minutes, my children began scripting their stick puppet show. I couldn’t believe how much effort and creativity they put into the planning and practice of their stick puppet show. That evening, they were so proud to “perform” for their dad after dinner and the show ended with much applause to their delight. Though the Stick Puppet Party! Kit is recommended for ages 6-adult, my 3, 4 and 5 years olds had no trouble at all assembling with supervision and a little help at times from me and to tell you the truth, it was so much fun that I would have wanted to “play” regardless. The Stick Puppet Party! Kit would be such a fun group project at Thanksgiving or over the holidays when all the children get together and can use their creativity and even have a remembrance to take home with them. At only $16 for the Stick Puppet Party! Kit (Classic 5) kit and or $25 for the Stick Puppet Party! Kit(Classic 10) kit this is a very affordable and fun gift idea for the holidays or a sure way to make your upcoming party a hit with the kids. To purchase the Stick Puppet Party! or to view the entire selection of Stick Puppet Party! Kits available at Tigercandy Arts, Inc. head over to their website. My kids had so much fun that I am planning to surprise them with another kit in their stocking just so I can have the pleasure of seeing what they stick puppets they want to create next. Simply Stacie readers can save 10% using this discount code exclusive for Simply Stacie readers and valid on all Stick Puppet Party! Kits at Tigercandy Arts, Inc.: use code “Stacie” at checkout. I like Penny dog socket. Sock puppts are soo cute!